Grade existing class worksheets, paper-based tests, and textbook material in the Answer Key Mode. 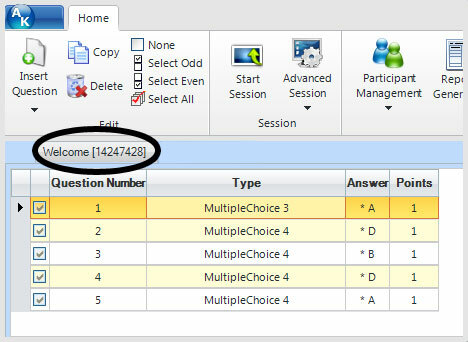 Double-click on the Answer Key icon to launch the program. Click the Insert a Question button and select the desired question type. Click on the Answer field to set correct answer and advanced grading options (if applicable). When the answer key is complete, go the File menu and select Save. Please Note: If you delete a question or if the numbering is not in sequential order, go to the Tools menu to select Renumber Questions to correct. The Answer Key application will open. Click the Start Session button. Select a Participant List . When all answer keys have been completed, click CEndSession.jpg End Session. You will be taken back to the Answer Key Maker window. Go to the Edit menu and select Select Odd. Only the odd-numbered questions will be checked. Participants will only answer the odd-numbered questions during their answer key. Go to the Edit menu and select Select Even. Only the even-numbered questions will be checked. Participants will only answer the even-numbered questions during their answer key. Participants will only answer the selected question numbers during their answer key. 3. Open another answer key and do the same. 4. With both files open, click Advanced Session and select Present Multiple (All Open Files). 5. The Presentation Setup window opens. 6. Select a Participant List. 7. Select how results will be saved. 8. Select your presentation settings. 9. Click OK to begin the presentation. 10. Activity ID appears on the participant’s remote LCD screen. 11. Enter the test number (activity ID) of the answer key into the remote and press the Send key. 12. The answer key will load into the remote. 13. When all answer keys have been completed, click End Session. 14. You will be taken back to the Answer Key Maker window. 15. The results will be saved in the location you selected. Select a report type and click Generate. See Results for details.